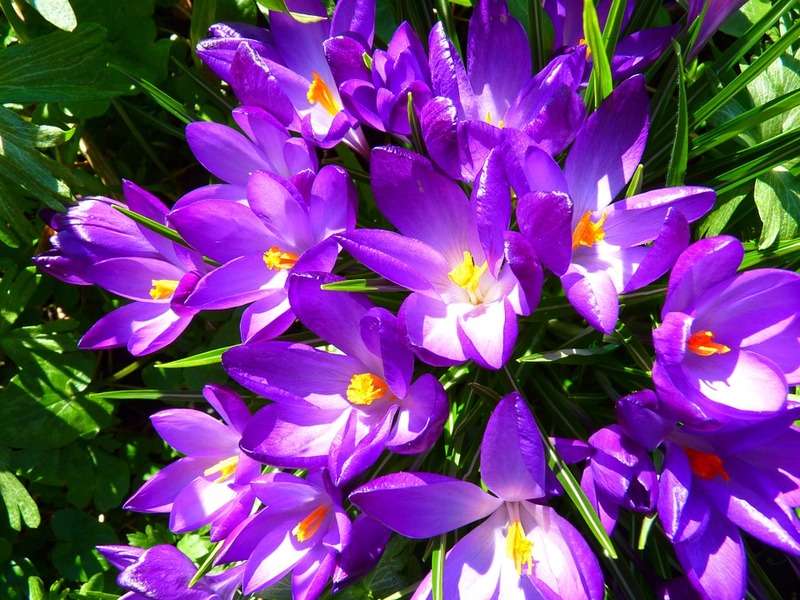 Could Crocus Sativus (Saffron) Be as Effective as Stimulant Medicines in Treating ADHD? Attention-deficit/hyperactivity disorder (ADHD) is one of the most common mental disorders with prevalence of 3%–7% among school-age children and its symptoms persist in 60% of adults. It is estimated that the prevalence of ADHD in adults is ∼4% (Castells et al. 2011). “ADHD has negative effects on children and their parent’s lives and also inflicts financial cost to the community.” ADHD can cause social problems for children such as weak intrapersonal and interpersonal relationships, low self-esteem and low quality of life. School success and academic achievement is also affected by this problem. Unfortunately, Children with ADHD are highly at risk for motor vehicle accidents and substance use disorders (Harpin 2005; Barkley 2008). There are several approaches to manage ADHD, but pharmacotherapy is the standard approach with central nervous system stimulants as first-line medications. The most common prescribed drug for treatment of ADHD is methylphenidate (MPH) and it is believed that it can improve cognitive function through a dopaminergic effect (Storebø et al. 2015). Although, methylphenidate has increased quality of life in children and has been considered as an effective drug, some nonserious adverse effects, such as problems with sleeping, nausea, and loss of appetite, have been reported. In addition, ∼30% of children with ADHD do not respond to methylphenidate, and its side effects has forced patients to give up their therapy period (Spencer et al. 1996). Thus, in recent years, several nonstimulant strategies have been developed for treatment of ADHD. Among these medications, antidepressants are used and have been reported to be effective in improving ADHD symptoms (Banaschewski et al. 2004; Zarinara et al. 2010; Salardini et al. 2016). Furthermore, these agents also produce several adverse reactions, such as anticholinergic effects, orthostatic hypotension, and arrhythmias (Demyttenaere 1997; Akhondzadeh et al. 2005). So far, the outcome with these approved medications for ADHD are often unsatisfactory and there is an empty place to be filled by alternative medications, in particular herbal medicines (Modabbernia and Akhondzadeh 2013). Herbal medicine is still the mainstay for primary health care for ∼80% of the world population in both developing and developed countries because of better cultural acceptability and safety profiles (Ernst 2005). Crocus sativus L., also known as saffron, is the world’s most expensive spice and was traditionally used for its antispasmodic, antiseptic, antidepressant, anticancer, and anticonvulsant effects (Ríos et al. 1996; Srivastava et al. 2010). It is thought that saffron and its active constituents can increase the reuptake inhibition of dopamine and norepinephrine and are N-methyl D-aspartic acid (NMDA) receptor antagonists and GABA-α agonists. Its therapeutic properties have been scientifically proven and demonstrated in numerous animal and human studies, including memory enhancement, antidepressant, antianxiety, and neuroprotection studies (Pitsikas and Sakellaridis 2006; Pitsikas et al. 2008; Akhondzadeh et al. 2009; Wang et al. 2010). Taken together, since saffron is a “putative” antidepressant and antidepressant agents are acceptable for treatment of ADHD, we hypothesized that saffron intake would be of benefit in these patients. In addition, having the ability to affect both monoaminergic and glutamatergic systems also qualify saffron as a possible candidate for the treatment of ADHD due to malfunction of these circuits in this disorder (Sarris 2007; Curatolo et al. 2009). 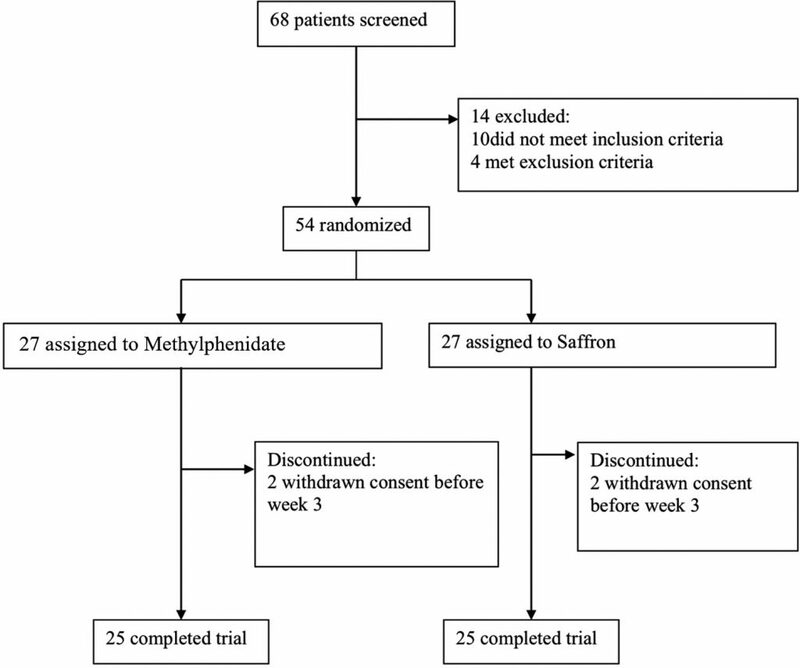 Given these data and lack of clinical research on utilization of saffron in ADHD, we conducted a “randomized, double-blind pilot clinical trial” to compare the efficacy and safety of saffron capsules with a commonly used stimulant medication (methylphenidate) in children who were suffering from ADHD. A single-center, randomized, double-blind, parallel-group clinical trial conducted over 6 weeks from January 2017 to October 2018 at the outpatient child and adolescent psychiatry clinics at Roozbeh Psychiatric Hospital (affiliated with Tehran University of Medical Sciences). The study was approved by the Institutional Review Board (IRB) of Tehran University of Medical Sciences (Grant No. 32600) and was in consistence with the Declaration of Helsinki and its subsequent revisions. The trial was registered at the Iranian Registry of Clinical Trials (registration No. IRCTID: IRCT201701131556N94). After a complete description of the procedures and the purpose of the study, a written informed consent was obtained from each patient’s parent or legal guardian. Each participant and their legal guardian received explanations that they were free to withdraw from this trial and return to their standard treatment. Patients were recruited from outpatient boys and girls 6–17 years of age who met the criteria for ADHD based on Diagnostic and Statistical Manual of Mental Disorders, Fifth Edition (DSM-5). To be included, the patients had total and/or subscale scores on Attention-Deficit/Hyperactivity Disorder Rating Scale-IV (ADHD-RS-IV) of at least 1.5 standard deviations (SDs) above norms for patient’s age and gender (DuPaul 1998). Before entry, the diagnosis of ADHD was confirmed by the participant’s child psychiatrist based on the DSM-5 criteria for ADHD, the Kiddie Schedule for Affective Disorders, and Schizophrenia-Present and Lifetime diagnostic interview and a thorough medical evaluation was performed (Ghanizadeh et al. 2006). A complete medical history was taken and a thorough physical examination was performed. Parents were also carefully interviewed and were requested to rate the severity of the ADHD-RS-IV symptoms based on the behavior of their children at home. Exclusion criteria were psychiatric comorbidities (except for oppositional defiant disorder), mental retardation (defined as intelligence quotient below 70), clinically significant chronic medical condition (such as seizure, organic brain disorders, and/or cardiac abnormalities), systolic blood pressure over 125 mmHg and/or resting pulse below 60 or over 110 beats/min, history of allergy to saffron, psychotropic medication use in the past 2 weeks, females who were likely to go through pregnancy or lactation, use of any medication that might have adverse reactions with saffron, including warfarin, aspirin, other antiplatelet agents, herbal medicines (such as garlic, feverfew, ginseng, dong quai, red clover, and other natural coumadins), and patients who were going to undergo surgery within 36 hours to 14 days. Additionally, before initiation of study medications, physical examinations were performed on all patients to assess body weight, blood pressure, and pulse rate. The patients were randomized into two parallel groups. The first group received Ritalin® (MPH) at a dose of 0.3–1 mg/(kg·d). Methylphenidate was titrated up during the trial according to the following schedule: 10 mg/d (5 mg in the morning and 5 mg at midday) in week 1; 20 mg/d (10 mg in the morning and 10 mg at midday) in week 2; 20 mg/d for children <30 kg and 30 mg/d for children >30 kg (10 mg in the morning, 10 mg at midday, and 10 mg at 04:00 PM) in week 3 and thereafter. The second group received saffron capsules at a dosage of 20–30 mg/d depending on weight (20 mg/d for <30 kg and 30 mg/d for >30 kg). Each capsule contains 10 mg of saffron (ACER). Symptoms were rated using the Parent and Teacher ADHD-RS-IV at baseline and weeks 3 and 6 (DuPaul 1998). The ADHD-RS-IV has been used extensively in Iran and offers valid measurement of attention and behavioral problems in school-age children (Amiri et al. 2008; Abbasi et al. 2011; Jafarinia et al. 2012; Salardini et al. 2016). It assesses the 18 symptoms of ADHD based on a 4-point scale. The primary outcome measure was change in scores of the parent version of ADHD-RS-IV from baseline to week 6 in each group. Secondary outcome measures were the change in scores of the teacher version of ADHD-RS-IV and response rate in each group. Assuming a mean difference (MD) of 3 on the Teacher and Parent ADHD Rating Scale, an SD of 3 on the Teacher and Parent ADHD Rating Scale (according to the pilot study), a power of 90%, and a two-tailed significance level of 0.05, a sample size of 46 was calculated. With prediction of 10% attrition rate, 50 patients were needed (25 in each group). Patients were randomized by the permuted block method using a computerized random number generator (allocation ratio 1:1, blocks of 4). Treatment allocation was concealed from patients and the physician who rated patients by using successively numbered, opaque, and sealed envelopes. Separate individuals were responsible for randomization and rating patients. The patients, physicians who evaluated them and prescribed medications, and the statistician were all blind to allocation. The participants received a thorough explanation that they were free to withdraw from this trial and return to their standard treatment. The patients were asked to inform the physician of any unexpected symptoms or complaints during the trial. Physical examination was performed for all patients and their body weight and vital signs were recorded at the screening session. Serum chemistry and hematology tests were also taken. Participants were asked to immediately inform the research team in case of any unexpected symptom or complaint during the study period. They were systematically asked for any side effects during the course of study using a checklist administered by a child psychiatrist at each visit (Khajavi et al. 2012; Kashani et al. 2013). IBM SPSS Statistic 25 (IBM Corporation, Armonk, NY) was used to carry out data analysis. Categorical variable was presented as number of patients and as a percentage. Continuous variable was reported as mean ± SD, unless stated otherwise and mean (95% confidence intervals, 95% CIs) was used to report MD. General linear model repeated measure was used to compare ADHD Rating Scale scores between treatment groups during the study course. The two groups were considered as a between-subject factor, whereas the three measurements were counted as within-subject factor. Whenever Mauchly’s test of sphericity was significant, Greenhouse–Geisser correction was used for degrees of freedom. In addition, a one-way measure analysis of variance with a two-tailed post hoc dependent t-test was performed to evaluate efficacy of each protocol on reduction of ADHD Rating Scale scores. To compare score changes from baseline between the two study groups, the t-test was performed. Categorical variables were compared using Fisher’s exact test or the chi-square test. A p-value <0.05 was considered statistically significant in all analyses. A total of 68 patients were screened, 14 of which did not meet the eligibility criteria. Fifty-four patients were randomly allocated to two groups. Twenty-seven patients received Ritalin and 27 patients received saffron. Finally, 50 patients (25 patients in each group) completed the trial (Figure 1). No significant difference was observed with regard to basic characteristics of subjects such as age and gender between the two groups (Table 1). There was no significant difference in terms of Parent ADHD Rating Scale scores at baseline between the saffron and the MPH groups (34.20 ± 4.69 vs. 33.56 ± 6.48, respectively, MD [95% CI] = 0.64 [−2.58 to 3.86], t = −0.400, df = 48, p = 0.691). General linear model repeated measures showed no significant effect for treatment (between-subject factor; F = 0.672, df = 1, p = 0.416). The trend of the two treatment groups was similar across time as was shown in the effect of time × treatment interaction (Greenhouse–Geisser corrected: F = 0.749, df = 1.317, p = 0.425) (Figure 2). Similar effects were observed for the time × treatment interaction, and the treatment group in hyperactivity (Greenhouse–Geisser corrected: F = 0.421, df = 1.348, p = 0.578) and inattention (Greenhouse–Geisser corrected: F = 0.755, df = 1.340, p = 0.425) subscales of the Parent ADHD-RS-IV. Moreover, a significant effect of both treatments on improving Parent ADHD Rating Scale scores was demonstrated (p < 0.001 for both saffron and MPH groups). In both groups, post hoc comparisons of Parent ADHD Rating Scale showed a significant reduction as soon as week 3 (p < 0.001). There was no significant difference between the treatment groups at the endpoint (p = 0.975). This observation was similar for both Inattentive and Hyperactive/Impulsive subscales as well (Table 2). No significant difference was observed on the score reductions of the Parent ADHD Rating Scale at week 6 compared with baseline in the two groups (p = 0.731). Figure 2. Repeated measure for comparison of the effects of two treatments on Parent ADHD Rating Scale score. Values represent mean ± standard error of mean. ADHD, attention-deficit/hyperactivity disorder. The responder rate (defined by at least 40% decrease in Parent ADHD Rating Scale scores between the baseline and the endpoint) was not significant between saffron and MPH groups (saffron: 100%, 25 of 25, and MPH 96%, 24 of 25; Fisher’s exact test p-value = 1.000). The marked improvement (defined by at least 50% decrease in Parent ADHD Rating Scale scores) was not significant between saffron and MPH groups (saffron: 96%, 24 of 25, and MPH 84%, 21 of 25; Fisher’s exact test p-value = 0.349). There was no significant difference in baseline Teacher ADHD-RS-IV total scores between the saffron and the MPH groups (24.16 ± 8.32 vs. 23.64 ± 8.16, respectively, MD [95% CI] = 0.52 [−4.16 to 5.20], t = −0.223, df = 48, p = 0.824). General linear model repeated measures showed no significant effect for treatment (between-subject factor; F = 0.117, df = 1, p = 0.734) and time × treatment interaction (Greenhouse–Geisser corrected: F = 0.249, df = 1.410, p = 0.701) (Figure 3). 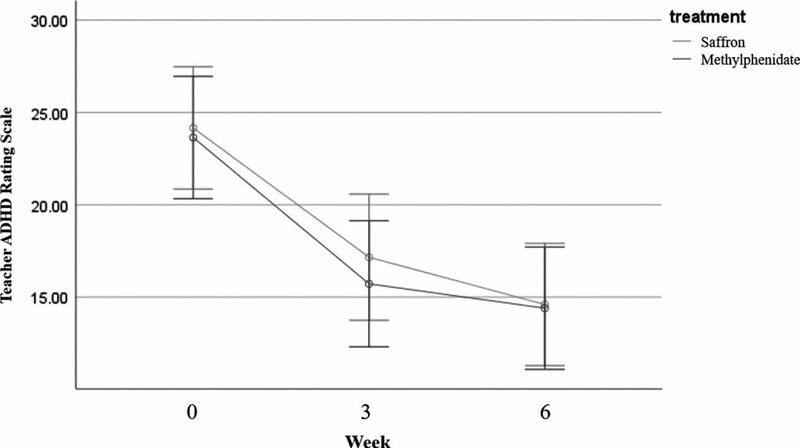 Similar results were observed for the time × treatment interaction, and the treatment group in hyperactivity (Greenhouse–Geisser corrected: F = 0.744, df = 1.402, p = 0.434) and inattention (Greenhouse–Geisser corrected: F = 0.046, df = 1.392, p = 0.901) subscales of the Teacher ADHD-RS-IV. Post hoc comparisons in both groups showed significant improvement in Teacher ADHD scores as soon as week 3 (p < 0.001). The difference between the two groups was not significant at weeks 3 and 6. Two groups showed no significant difference in hyperactivity or inattention subscales, either (Table 2). 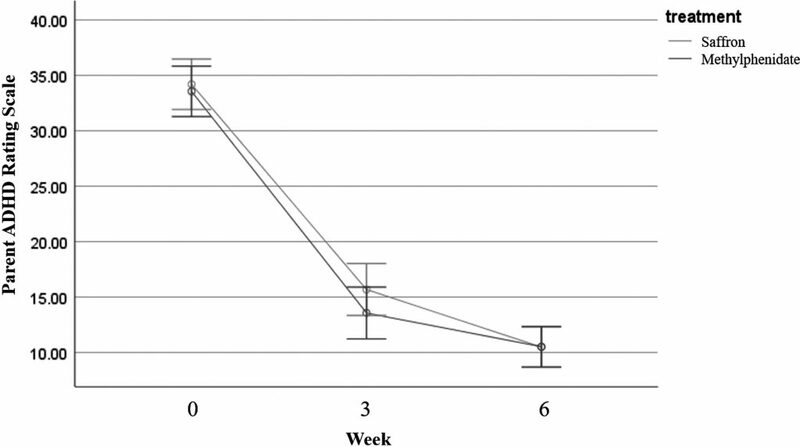 No significant difference was observed on the score reductions of the Teacher ADHD Rating Scale at week 6 compared with baseline in the two groups (p = 0.883). Figure 3. Repeated measure for comparison of the effects of two treatments on Teacher ADHD Rating Scale score. Values represent mean ± standard error of mean. ADHD, attention-deficit/hyperactivity disorder. There was no significant difference between the two groups in terms of the responder rate defined by at least 40% decrease in Teacher ADHD Rating Scale scores (saffron: 52%, 13 of 25, and MPH 56%, 14 of 25; p = 0.777). The marked improvement (defined by at least 50% decrease in Teacher ADHD Rating Scale scores) was not significant between saffron and MPH groups (saffron: 40%, 10 of 25, and MPH 48%, 12 of 25; p = 0.569). The most probable side effects were recorded (Table 3). No serious adverse event was observed in any of the patients and all noticed adverse effects were mild to moderate and tolerable. The frequency of side effects was not significantly different between the saffron and MPH groups. This study provides evidence for satisfactory outcomes with saffron in treatment of ADHD. In this double-blind randomized trial of C. sativus versus methylphenidate in treatment of ADHD, C. sativus was as effective as methylphenidate. The clinical relevance of these findings was emphasized by improvements seen in both Parent and Teacher Rating Scale scores. Also C. sativus was safe and showed equally or lesser adverse effects. The pathophysiology of ADHD is complicated and many different mechanisms, such as reduced brain volume in the prefrontal cortex, cerebellum, and basal ganglia, are involved (Fusar-Poli et al. 2012). Higher-level cognitive areas of the brain, especially the frontostriatal circuits, have been shown to be involved in the pathology of ADHD in imaging studies (Giedd et al. 2001; Durston 2003). Also, there is malfunction in neurotransmitter network systems particularly in dopamine and norepinephrine pathways, which can explain why methylphenidate is effective for treatment of ADHD (Curatolo et al. 2009; Sharma and Couture 2014). Regarding FDA-approved medications for treatment of ADHD, stimulants like Ritalin, Metadate CD, Methylin ER, Cotempla XR are first-line therapy. Although the most effective treatment is Ritalin, Dexmethylphenidate (Focalin, Focalin XR) is second in line (Mannuzza et al. 2008; Daughton and Kratochvil 2009). Among these drugs, methylphenidate is a popular stimulant. However, we cannot ignore its side effects. Nausea, stomach pain, decreased appetite, insomnia, and headache are the most highlighted undesirable effects. Methylphenidate adverse effects on the cardiovascular system include tachycardia and palpitations (Ismi et al. 2018). These side effects and resistance to the first-line medication has resulted in the use of more effective or at least safer medications like herbal medications, which are popular among people in primary health care (Spencer et al. 1996; Modabbernia and Akhondzadeh 2013). One assessed the evidence for complementary medications, including herbal and nutritional products in the treatment of ADHD. It revealed that some herbal medicines use kava (Piper methysticum) or brahmi (Bacopa monniera), which may have some beneficial effects on mental performance as well as cognition, but these studies did not consider saffron (Sarris et al. 2011). 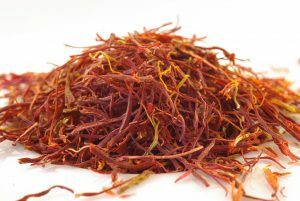 Saffron is an herb derived from red stigma of C. sativus and known as a spice and nutritional supplement in traditional medicine in many parts of the world, such as India, Spain, France, Greece, and especially Iran. Iran now has about 90% of the world’s production of saffron (Ríos et al. 1996; Christodoulou et al. 2015). Almost 150 different components are detected in saffron, including carbohydrates, polypeptides, lipids, and H2O, but the main components which have medical effects are crocetin, crocin (responsible for color), picrocrocin (responsible for taste), and safranal (responsible for odor) (Schmidt et al. 2007). It is thought that saffron and its active constituents can increase the reuptake inhibition of dopamine and norepinephrine and are NMDA receptor antagonists and GABA-α-agonists (Sarris 2007; Alavizadeh and Hosseinzadeh 2014). To the best of our knowledge, this randomized, double-blind study is the first to be published on the effects of saffron extract for treatment of ADHD in comparison to a stimulant; therefore, it is not possible to draw any comparisons with other clinical studies. The results of this study must be considered as preliminary. This 6-week course of treatment with saffron showed the same efficacy as methylphenidate in children with ADHD. In terms of safety, there is no significant difference between the two study groups in frequency of side effects. Considering the memory-enhancing and antidepressant effects of saffron, future studies on the effectiveness of saffron compared with placebo should include a broader spectrum of ADHD patients, including those with comorbid mood and anxiety disorders, sleep problems, and ADHD patients with inattentive presentation. Nevertheless, larger “placebo-controlled studies” with longer treatment periods are indicated for future studies. This study was the postgraduate thesis of Dr. Sara Baziar under supervision of Prof. Shahin Akhondzadeh. The funding organization had no role in the design and conduct of the study; in the collection, analysis, and interpretation of the data; or in the preparation, review, or approval of the article and the decision to submit the article for publication. For references, a pdf version, and the original article click here. Journal of Child and Adolescent Psychopharmacology, published by Mary Ann Liebert, Inc., is the premier peer-reviewed journal covering the clinical aspects of treating this patient population with psychotropic medications. The above article was first published in athe March 2019 issue of Journal of Child and Adolescent Psychopharmacology with the title “Crocus sativus L. Versus Methylphenidate in Treatment of Children with Attention-Deficit/Hyperactivity Disorder: A Randomized, Double-Blind Pilot Study“. The views expressed here are those of the authors and are not necessarily those of Journal of Child and Adolescent Psychopharmacology, Mary Ann Liebert, Inc., publishers, or their affiliates. No endorsement of any entity or technology is implied.